Particle physicists from around the world who have used the subatomic particle detector, CLEO, to probe the mysteries of the subatomic world are celebrating their 500th academic paper submitted to a peer-reviewed journal. This number of papers, officials say, sets a new world record for a particle physics scientific collaboration. The 500th paper, titled “Improved Measurements of Semileptonic Decays of D Mesons to Pi and K Mesons,” was published in the journal Physical Review D at the end of August, it describes ultra-precise measurements that could shed light on how the matter in stars, galaxies and humans survived the Big Bang. Purdue faculty, post docs and students, are leading members of CLEO. Professor David Miller (1992-95) and professor Ian Shipsey (2001-04) have served as spokespersons of the collaboration. Shipsey and Purdue graduate student Bo Xin, Cornell faculty member Ritchie Patterson and Cornell graduate student Laura Fields were the analysis team that produced the 500th paper. The fundamental particles called quarks exist in atom-like bound states, such as protons and neutrons, that are held together by the strong force. The heavier varieties of quark, such as the beauty and charm quarks studied by CLEO , can undergo radioactive disintegration to produce other, lighter particles. The pattern of the disintegration rates is constrained, but not determined, in the prevailing theory of fundamental particles, the standard model. Departures from the expected pattern are eagerly sought as they are a window to understanding a phenomenon called CP violation a subtle asymmetry between the properties of matter and anti-matter that is believed to have shaped the universe before it was a pico-second old (a pico-second is one trillionth of a second) . At that time heavy fundamental particles were common. would be no matter in the Universe today. 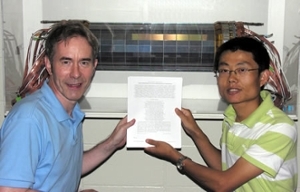 Makoto Kobayashi and Toshihide Maskawa received the 2008 Nobel Prize in Physics for their discovery of the relationship between CP violation and the pattern that bears their names. Although accurate measurements of the quark decay rates have been made, the window to the young universe has been obscured. This is because the binding effect of the strong force between quarks modifies the decay rates: unless correction factors can be accurately worked out, the data cannot be fully interpreted. This was a stumbling block for 40 years. Then in 2001 an advance in lattice quantum chromodynamics (LQCD), a method of calculating the effect of the strong force on teraflop scale computers, promised the calculational precision required. The best place to test the calculations was to study particles called D mesons which are a bound state of a charm quark and a light anti-quark, In 2003, by modifying CESR the CLEO experiment was uniquely placed to produce and study prodigious quantities of D-mesons. "Success of LQCD calculations in D meson decay would directly improve measurements of two of the elements of the pattern , and substantially increase confidence in the applicability of the theory to determining two others. These experimental tests of LQCD are a major focus of the CLEO collaboration", said Bo Xin. Laura Fields, of Cornell University, and Xin were the two graduate students involved in the measurements reported in the 500th paper along with their major professors Ritchie Patterson of Cornell and Shipsey of Purdue. "Correction factors called form factors are measured by the CLEO collaboration and are calculated by the Fermilab Lattice and MILC collaborations. Our measurements are the most precise to date. They are in agreement with LQCD but have smaller uncertainties, and so will be an incisive test of future calculations", said Laura Fields. The LQCD group submitted a companion paper to Physical Review D describing their calculations of form factors and comparisons between theory and experiment. areas of particle physics, such as the interpretation of the eagerly anticipated data from the Large Hadron Collider, and in nuclear physics and astrophysics as well. window for the first time. If they see a pattern of quark-decay rates that does not conform to the standard model, the deviations might provide information about new physical phenomena — phenomena give rise to the asymmetry between matter and antimatter that permits us to exist. The CESR program is supported by the U.S. National Science Foundation. CLEO collaborating institutions are supported by the U.S. National Science Foundation, the U.S. Department of Energy, the Natural Sciences and Engineering Research Council of Canada, and the U.K. Science and Technology Facilities Council.